We’re getting used to the ACA. When I was a young violin student I had to change violin sizes at various times as I grew. Each time felt funny, and each time my teacher would say “You’ll get used to it”. The Affordable Care Act, i.e ACA, i.e Obamacare, is now hated by fewer people. Only 43% of Americans oppose it, down from 53%. Pundits are saying this is because the recent open enrollment period went smoothly. That may be true, but if we take a lesson from history we can see that slow acceptance of the ACA is to be expected. We’ve gotten used to it. Take, for example, the New Deal. The New Deal was a set of laws enacted in the wake of the Great Depression. These laws resulted in policies and institutions such as the FDIC, the criminalization of child labor, the Fair Labor Standards Act that established the 40 hour work week, and Social Security. Most people today would consider much of the New Deal to have been a pretty good idea. But that was not the case in the 1930s when these laws were passed. Rich people didn’t like it. Republicans didn’t like it (they thought the Social Security Act smacked of socialism. Funny, huh?). Conservatives thought there was too much infringement on individual rights. A third of the public didn’t like it, as judged from the 1936 election. Doomsday predictions claimed that the legislation would take away human rights, create too much big government, and ruin the constitution. Some would still argue that these predictions came true to some extent, but no one wants a repeal of child labor laws, and Social Security is now a political third rail. In the case of the ACA, the opposition has been remarkably similar. Infringement on individual rights, states rights, big government, socialism, unconstitutionality, all these accusations have been thrown at the ACA. Additionally we have been told that the ACA would bankrupt the government, limit physician choice, and establish death panels. Some of these claims are still under review. But health care spending has gone down, more people have access to health care, and no death panels have materialized. Parts of both the New Deal and the ACA either didn’t work or were deemed unconstitutional. But some parts stayed, and eventually became part of life in America. People got used to it. Just as people are getting used to the ACA. As Congressional Republicans are acutely aware, it is much easier to prevent something from happening than it is to take it away once it has happened. This fact is based in the human tendency to give much more weight to loss than gain. We see this in end-of-life discussions, where doctors find it is more painful for families to decide to remove life support than to decide not to institute it. Such tendencies can be positive or negative. At work it is well known that once a new rule gets instituted we’re stuck with it; a rule, once made, is virtually impossible to get rid of, even if it doesn’t have the desired effect. Standardized testing in public schools is here to stay too, even though such testing has been shown to be a poor measure of real learning. On the other hand, a rule that works and makes sense, like a seat belt law, will also never go away, and eventually people get used to it and lives are saved. Once people got used to Social Security it became impossible to take it away. Once people get used to having insurance it will eventually become impossible to take it away. Once something becomes status quo people tend to forget what they were so worried about. Thanks to our Dear Leader for the link to the Republican’s health reform proposal, cutely called PCARE. Professor Wright is the expert and will look through it carefully and give you the real scoop. I’ll be the opening act. I’ve read through it, and there are some good things in it, although you have to skip the rhetoric spouted in the first few paragraphs of every section. To wit: “Despite promises that Obamacare would lover health care costs, costs continue to skyrocket for patients, families, taxpayers, and businesses.” Actually, the Kaiser Family Foundation says that Medicare spent $1000 less per person last year, and is projected to remain steady at 14.5% of the federal budget and 3% of GDP. Non-partisan this treatise is not. 1. There is a proposed provision for extending health insurance policies across state lines. This would certainly help equalize coverage quality and could promote competition. It is worker-friendly and makes sense. Medicare is already nationwide, although the private insurance companies that actually provide a lot of the policies are not. So, OK. I wonder, though, since as I point out below the plan lays an awful lot of the responsibility for all of this stuff on the states. 2. The republicans like health care savings accounts, or HSAs (personal responsibility and all that) and would like to expand this option. Great as long as you have two coins to rub together at the end of the month. 3. They want to keep the coverage for kids under their parent’s plan ’til age 26. I guess that one polls well. 4. Tort reform. Amen. Caps on non-economic damages and limitations on attorney’s fees. 5. Transparency. “…health insurance plans would be required to disclose covered items, drugs, and services, any plan limitations or restrictions, potential cost sharing, the actual cost of services (my boldface), the claims appeal process, as well as the providers participating in the plan.” Some of this is already required, but some real information about cost would be welcome. 1. The plan throws out the rule that insurance companies cannot charge elderly patients more than 3 times what it charges a young person. This is considered “too restrictive” and the new proposal ups the number to 5 times. This is supposedly better because premiums would go down for millions of Americans. That it will also go up for millions of Americans is not mentioned. 2. The proposal seems to throw the ball back into the state’s courts. States can opt out of the coverage for kids under age 26, they can adjust the amount the elderly pay in comparison to the elderly, re-using the high-risk pool idea within states, and making the states negotiate the terms of cross-border agreements. Perhaps most oddly, it asks the states to designate health plans that would be the default coverage for people who don’t choose a plan. Wait, weren’t most states perfectly happy to let the federal government set up the health insurance exchanges? 3. The republicans also really like using tax credits, which I think have already been tried. Many times. Those italics are not mine. People with pre-existing conditions who have been uninsured would supposedly get a grace period in the form of a one-time enrollment period in which they could not be denied for a pre-existing condition. So people who are not “responsible” (here read “poor”) aren’t entitled to this so-called consumer protection. I could be wrong about this, but I need a much better explanation about why the ACA’s rule that you can’t turn anyone down for a pre-existing condition at any time is so bad. As the health insurance exchanges opened for enrollment just days ago, the federal government, including the President and the Department of Health and Human Services (HHS), had to acknowledge that it was not technologically ready. The IT infrastructures by which individuals tried to sign up for health insurance crashed and were unavailable throughout the first day and the weeks after. Those same sights were supposed to track enrollment, but proved to not be as well tested and far more expensive than originally anticipated. However, despite the shortages and disappointments with government IT readiness for exchange websites, there was a surge in US-based startup companies that demonstrated just how innovative and forward thinking technology can be in the health care arena. Nine new companies, all curated through BluePrint Health were introduced at that same time three weeks ago on “Demo Day,” and were ready to show the new frontier of health care, and how to transform care delivery through technology. He asserts that what makes BluePrint successful is that it is, “uniquely positioned to attract, identify, and support the entrepreneurs that fill the gaps of service left in the wake of massive industry changes.” The accelerator program promotes the mindset that new businesses should not have to focus exclusively on fundraising. Hayes says, “Building a company is extremely difficult, and a founders’ time is best spent on customer and product development, not fundraising.” With that mentality, BluePrint does not use many pre-established filters when evaluating the near 1,000 applications it receives each year, but instead concentrates on business models. The nine particular startup companies that were cultivated during the summer of 2013 range from Healthify, which focuses on creating platforms that connect and standardize medical homes to treat social needs to Board Vitals, an organization that improves the testing system of our nation’s providers. Each of these new businesses gives hope to innovators and entrepreneurs. Artemis is a health care analytics firm specializing in benefit claims. With employers spending billions of dollars on health care, benefits managers need more information than the historical, once a year paper reports of the past. With the Artemis platform, benefit managers have graphical, real-time updates for claims and assessments. The creators claim that that deploying its tactics not only saves money for organizations, but also heads off future costs through prevention and determination of key cost drivers. Board Vitals brings together publishers, universities, and top physicians into a single digital platform for medical specialty education, with pass rates that are 10% higher than the national average. According to co-founder, Dan Lambert, “Content is continually voted up and down, meaning that the very best material comes to the top and outdated or incorrect content is voted out.” His partner, Andrea Paul added that their aggressive, but attainable, goal is to have materials for 20 of the 35 specialties in 2014. The founders of CredSimple created a system to make the mandatory credentialing of physicians cheaper and more efficient. According to co-founder Garry Choy, at present, credentialing takes two to three months per physician and hospitals spend millions a year on the routine, but inefficient process. CredSimple uses an impressive 214 data sources to verify credentials, saving all provider parties time and resources, with downstream positive implications for entire hospital systems. Pharmaceutical companies strive to gain pricing power and market share using genetic information about how patients respond to drugs. Genterpret, started by two system biology PhDs, links genetics to drug responses in one-third of the time (six months) of previous genetic testers. The faster turn-around time and vast outreach program created by the founders suggests that the Genterpret technology can soon be applied to thousands of diseases, improving health outcomes and saving money. After years of working in Baltimore health clinics, the creators of Healthify joined forces to start a company that addresses social needs such as food insecurities to improve health in communities. Medicaid spending on medical homes averages about $15 billion, much of which is spent on social needs. The data collected by Healthify will become vital as medical homes and accountable care organizations begin to address social needs as integral to overall health and well being. ReferBright helps health practitioners with digital marketing in a world full of medical advertisements. The goal, according to the founders, is to improve outreach and referral rates for various kinds of professionals. Additionally, the automated system makes updating personal information easy for practitioners and makes vetting of practitioners easy for hospitals, knowing the information on ReferBright has been inspected and verified. According to co-founder, Jarrod Wolf, SpotMe, “allows employers to reward their employees for attending any fitness facility, running in races, or for using fitness apps and devices. When the barrier to incentives are removed–like eliminating paperwork and providing immediate rewards–and employees are given the flexibility to choose how they engage in fitness, then program participation rates skyrocket.” This focus on wellness and fitness programs is to improve health outcomes and lower health costs through incentives, monetary and physical. The premise of Staff Insight is to increase workforce productivity, specifically through hospital leadership being able to understand and staff facilities to the optimal levels. The company aims to use real-time dashboard to identify staffing levels in units, test baseline productivity, set new benchmarks for productivity and ultimately save revenue for facilities by optimizing productivity. The founders claim that early adopters have already seen a two to four percent increase in productivity. WellTrackOne conducts a Medicare-approved personal assessment that hospitals can use to track patient data and identify potential risk factors. To lessen the administrative burden and disruption to the workflow, WellTrackOne claims that it can integrate all electronic health records, from multiple systems to improve data and health outcomes. Despite the federal governments success in getting support from professional athletic organizations and celebrities like Jennifer Hudson, the technological infrastructure just wasn’t ready for consumer usage. In contrast, Doug Hayes says that a key reason BluePrint startups were ready on Demo Day is due to the mentor community and outreach. He claims that a by-product of their focus on business models and portfolio is that it, “includes many enterprise solutions. The long sales cycle and disparate channels within health care makes enterprise sales an especially tough nut to crack. However, our experience within enterprise and our mentor community, 150 strong, makes us especially well positioned to help founders sell into large payers, provider networks, pharma, and other enterprise customers. Monday at 11:30am EST, President Obama spoke in the Rose Garden about the recent troubles with health insurance exchange enrollment and websites. With a team of young people standing behind him and Janice Baker at his side, the first person in the state of Delaware to successfully enroll in the exchange, President Obama said he was speaking to every American wanting to get affordable health insurance. He claimed that in the last three weeks, despite the horrific technological problems with the websites, that “half a million consumers across the country have submitted application through federal and state marketplaces.” He further touted that the “federal site alone has been visited 20,000,000 times” in the last three weeks. Unfortunately for those American’s who are really interested in signing up on the exchange sites, he glossed over the depth and breadth of the current troubles, giving a speech that sounded more like a State of the Union address with small-business examples and reading letters written to the White House. However, he failed to go any further to explain what those other underlying problems were or when specifically they will be fixed. He did say that while HHS and contractors such as CGI Federal are working out the “kinks,” American’s should be patient. He claimed that “if the product is good, [American people] are willing to be patient,” suggesting that there will not be a delay for the individual mandate. Nevertheless, he followed this by assuring the public that unlike Black Friday sales, the insurance plans will not run out like purchasing a new PlayStation – adding to the list of items the administration has compared exchange sites to, including iPhones and travel websites. Despite his promises of improvements and putting the “best and brightest” on the job, CNN and other sites have insisted that the inherent technological and platform problems with Healthcare.gov will not be resolved anytime soon. This begs the question, that if the federal government is now searching for the best and brightest to correct the estimated 5,000-5,000,000+ lines of coding that need to be fixed on the federal site alone, who was working on the original platforms? As he continued his speech, the President reminded the American public that although the websites for enrollment are not as, “quick, consistent or efficient as we want,” that the exchange sites are far more than “just a website.” He noted that many pieces of the Affordable Care Act (ACA) are already in place and being utilized by millions of Americans. He addressed pre-existing conditions, youth under the age of 26 and several other provisions that are already being rolled out by federal law, and the successes they have seen there. He noted more examples of ACA triumph in Oregon, where he maintained that the exchange, “has cut the number of uninsured people by 10% in three week,” which is about “56,000 more Americans” with health insurance coverage. During the speech, President Obama also tried to clarify the exchanges or marketplaces by describing them to the public as becoming part of a “big group plan… that bargains on your behalf for the best deal in health care.” He said that by doing so, insurance companies have created new products and options that strengthen market forces, leading to better deals. While that may be the goal of the Affordable Care Act, the underlying technological and coding problems may prove to make that impossible. For all intents and purposes, the Affordable Care Act (ACA), the President’s signature piece of legislation, will provide more health care coverage to poor and underserved populations. Persistently disadvantaged communities have much further to go than those with insurance, and new means of accessing and paying for care will benefit them disproportionately. Nevertheless, with more than 20 percent of the nation’s Black population uninsured, more than 30 percent of Hispanics uninsured and a country still grappling with understanding and properly addressing disparities, just how far does the ACA take us? By mandating individual health insurance coverage and expanding the list of covered preventative services, ACA legislation should, theoretically, improve the quality of health care for those populations at disproportionate risk of being uninsured and having low incomes. In advance of the January 2014 start of major health reform initiatives, some estimate that more than half of the uninsured will gain insurance coverage. However, research has shown that having health insurance itself does not have a substantial impact if people cannot find a doctor to see them, do not have proper information about accessing resources, or are not treated in a culturally and environmentally competent manner. Moreover, when the number of uninsured could be decreased by more than half, but being uninsured is not equitable across racial and ethnic groups in the US, what happens to our countries most vulnerable? It has been well documented that low-income individuals and those without employee-sponsored insurance (ESI) are more likely to be people of color. Kaiser and US Census estimates indicate that there are significant differences in insurance rates by race and ethnicity, with national averages approximating there are almost three times as many uninsured Hispanics as Whites. In Louisiana, for example, it is believed that more than 50% of the state’s Hispanics are uninsured, while only 18% of Whites are. In the same state, it is estimated that 30% of Blacks are uninsured, reiterating just how unbalanced our country remains and how terribly far we have to go to eliminate inequalities. The oft-cited example of health reform success is Massachusetts, where Blue Cross Blue Shield 2013 estimates indicate that about 97 percent of the state’s population has health insurance thanks to health reform. While this is a grand feat for gaining an insurance card, insurance alone does not constitute affordable, quality care, or improved long-term health and equity. The real successes come from improved statistics on accessing care, preventative care and disease reduction. For those looking to Massachusetts, data does support a slight improvement in overall access to care by showing that Whites, Blacks and Hispanics all had increases in the number of insured, and further that the percentage of the state’s population that had “any doctor visit in prior year” between 2006 and 2009 rose by more than five percent. Unfortunately, as many have argued, those for and against health reform, Massachusetts is not necessarily a good representation of other US states or populations, as anyone who has been to Massachusetts knows that the state population looks and behaves very differently from places such as southern California or the Southside of Chicago. Furthermore, even in Massachusetts the number of Blacks and Hispanics that remain uninsured is two and three times that of Whites, respectively. Many of those who will be left uninsured will be Blacks, immigrants and Hispanics, who will continue to use Emergency Departments for critical care or, worse, go untreated. Additionally, there are those who are lower middle class (a growing group in this nation) who fall into the economic gap where they cannot afford the employer/exchange insurance offered to them, but earn too much to receive subsidies for offsetting the mandatory cost of insurance, which are often people of color. Other groups of concern are those minorities who do not have the knowledge of where to access care, do not have the financial or transportation means to access care or still distrust the system due to systemic problems with culturally competent care. Although the ACA takes us a step forward in giving many of the countries uninsured an insurance card, the US must address what to do about probable provider shortages that will result from a lack of primary care physicians and different utilization in care. We must be prepared to understand both to cultural differences in demand and pent-up demand of the previously uninsured, as well as start to really face how to deal with persistent racial and ethnic inequality in this nation that shows itself in our health care system every day. In the coming weeks, months and years the US citizens have to do more than champion or attempt to repeal the ACA. Party lines and moderate attempts at change will never fix our broken health care system. We have to start addressing the real issues our country faces, those of injustice, unequal access and treatment and how we properly care for and address the needs of those who are not White and wealthy. This post is written by new Wright on Health blogging partner Nicole Fisher. Nicole is the Senior Policy Director at Health Systems Innovation Network where she does health economic and policy analyses generally focusing on Medicare, Medicaid and health reform. She also is a current PhD student at the University of North Carolina in the Health Policy and Management Department and writes on a variety of health care topics for several think tanks and websites. Nicole also has a masters degree in Public Policy from the University of Chicago and an undergraduate degree from the University of Missouri. With less than two years before state-based health insurance exchanges are to be operational, most state legislators and health policy experts still cannot come to an agreement on how to set up, operate, monitor or fund state exchanges. However, despite persistent confusion and concerns surrounding health insurance exchanges, the White House recently released a report on the progress of state-level health insurance exchanges. This publication took a favorable and possibly misleading view of the headway being made by states that are creating their online insurance marketplaces. The Administration claimed that there are currently 28 states making great progress in establishing an exchange. Even if that were true, this indicates that 22 states -or about 40 percent- are refusing to comply with the Patient Protection and Affordable Care Act (PPACA). Although the report does not lie, it also doesn’t exactly accurately portray where most states stand either… The Administration chose to furtively count states that fall into a grey area as making progress toward setting up an exchange. Many states have, in actuality, refrained from any legislative activity or the state legislature has merely set up a committee to “study options”. What this really indicates is that many states are purposefully not complying with the PPACA mandate to create an exchange, but also managing not to violate it so that they are allowed to keep federal funding, at least until the January 2014 deadline. Figure 1 below illustrates exchange status more accurately by categorizing, into six categories, where states stand in terms of state-based exchange implementation. These classifications range from states that have already established an exchange to states who have taken legislative action not to create an exchange. As the White House rightly exhibited, there are a few states that have made significant progress in setting up an exchange and benefited greatly from the extra federal dollars. Rhode Island recently received an additional $60 million from the federal government for their collaboration with Massachusetts and Vermont to improve system integration associated with health insurance exchanges. California, Colorado and Washington have also seen legislation signed into law following the passage of PPACA to implement a state health insurance exchange. 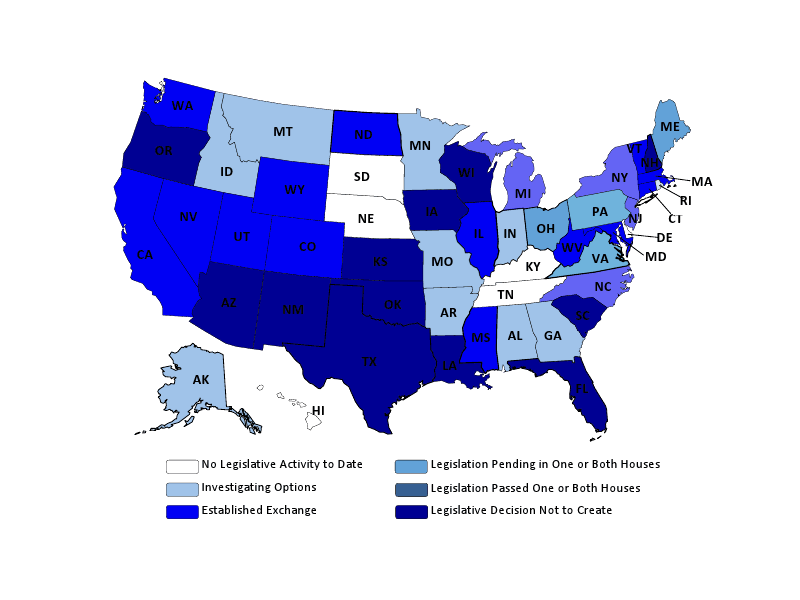 In contrast, based on a February 2012 analysis of all states, Figure 1 shows that five states have no legislative activity whatsoever related to a health care exchange; and several states such as Wisconsin, Louisiana and Florida not only rejected setting up an exchange, but returned the grant money bestowed to them from the federal government to establish an exchange. More common scenarios, and where Figure 1 differs from the White House, are that many states are merely “investigating options” or allowing an exchange bill to bounce around legislative committees but never go to a vote. These alternatives allow states to keep their federal funding, but take no action to set up an exchange. For example, the state of North Carolina had a Republican majority who drafted an exchange bill. That bill, however, was moved from one committee to another over than span of months for “reading.” For the past year, that same bill hasn’t seen the light of day and the Republican majority has no intention of ever letting it. This way, the state is allowed to spend federal exchange dollars, but not actually carry out the Administration’s plans. New Hampshire also had an exchange bill written, but after passing the Senate, that bill failed to pass the House of Representatives. In doing so, New Hampshire was allowed to keep exchange funding, but use the stalemate as a way of not having to revisit the idea of exchange implementation until a future session. South Carolina on the other hand used the original Exchange Planning Grant from the federal government to create an exploratory committee on exchanges, but decided after its creation that no legislation should be written. As the economic crisis continues, unemployment remains high and the Supreme Court prepares to hear oral arguments for various provisions of PPACA in March, the number of states moving forward with enacting an exchange should become stagnant. This could further undermine the “progress” being made by states that fall into the grey area. Regardless, whether states are stalling efforts to create state-level exchanges, “studying” alternative options and costs, or flat out rejecting the idea, it’s safe to say that the optimism demonstrated in the White House report is a bit rosier than the real state of state-level health insurance exchanges. When the Census Bureau released the latest numbers on insurance coverage, I wrote a post to highlight that nearly 500,000 young adults went from being uninsured to having insurance. An excerpt from that post actually got picked up by Jonathan Cohn at TNR. Now there’s more evidence that ObamaCare is working for both young and old Americans. The Department of Health and Human Services recently announced that, in fact, more than 2.5 million Americans between the ages of 19 and 25 were covered by their parents’ health insurance in the first half of 2011. That’s not surprising given that the Affordable Care Act included a provision that allows those under age 26 to remain on their parents’ coverage. And the good news isn’t just for twenty-somethings. Early data show that America’s seniors are also benefiting from the Affordable Care Act. How you ask? Well, one of the first provisions enacted targeted the Medicare Part D “donut hole.” Part D is the program that provides prescription drug coverage for Medicare beneficiaries, and it was designed with a giant gap in coverage right where people needed it most. (As an aside, that was done for purely political reasons, to keep the price tag a little lower on the legislation when it was being debated on Capitol Hill.) Well, ObamaCare didn’t completely eliminate the donut hole, but it did shrink it, by reducing the proportion of costs the beneficiary is responsible for. The result? Nearly 2.7 million older Americans saved an average of $569 each on their prescription drugs through October 2011. Moreover, some 24 million Medicare beneficiaries received free preventive care. This is good news served with a side of good news. It’s true that health reform is still very much in the process of being implemented. My glasses are not so rose-colored as to expect that every element of the law will be a success. Some things won’t work, and will need to be retooled or abandoned. But some things, as these developments underscore, will be successful, and when that happens, it should be roundly acknowledged.